Mission Chinese Food is a staple in San Francisco, the Ma Po Tofu there is always on the 7x7 list for the top 100 things to eat in SF. So when Mission Chinese opened a branch here in Manhattan earlier last year, I knew I needed to try it, especially since I never had it in when I was living in SF. Last weekend, I had an amazing Sichuan meal in Philly (at Han Dynasty, in case you were wondering) and it left me wanting more. I figured that on this cold winter day, it was finally time to make the trek down to Mission Chinese for some spicy food to warm me up. 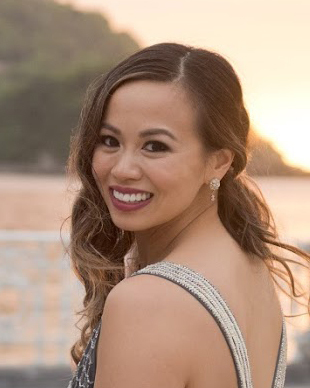 How long is the wait time on a Saturday Afternoon? 30-45 minutes. On a Saturday afternoon at 1:20, my friend put our name down for a table of 3 and we were told there would be a 45 minute wait. Great, so we had time to walk 10 minutes to Doughnut Plant and grab some amazing donuts, but more about that another time you can read about how Doughnut Plant saved the day here. We were called around 30 minutes later with our table ready. Sadly, because we were there for the afternoon, we didn't get the free beer that is served to guests who is waiting for dinner. 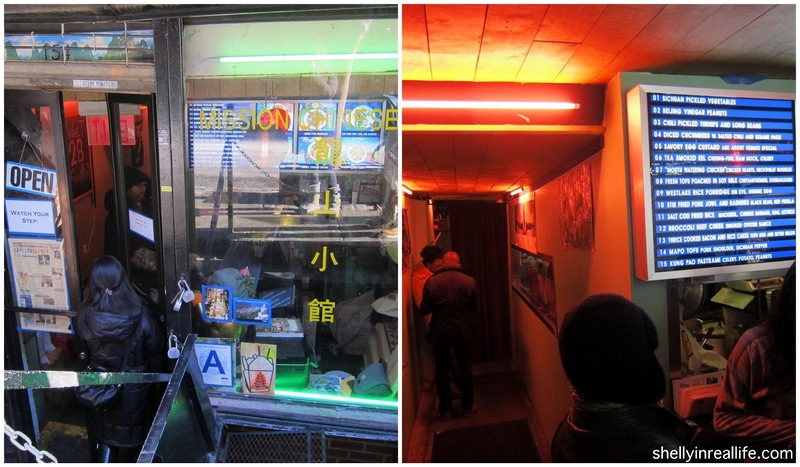 Supposedly the wait at Mission Chinese for dinner can range from 1-2 hours! Since there was so much hype with the place, when I saw a cocktail menu, you know I had to go for it and try. We ended up getting a the Laura Palmer (think tea and lemonade) and a T-1000, which is a vodka, soy milk cantaloupe type drink. For $12, it wasn't good and it wasn't bad, but it's not something I'd order again. I mean, plastic cups, really?? Now, I'm not suggesting that any of these tasted BAD, but seriously after the first dish, my entire mouth was coated with chili oil, my tongue was tingling and my taste buds were overwhelmed and numbed. 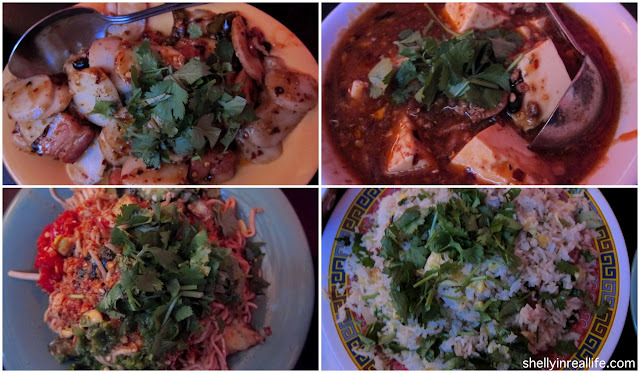 I know that Sichuan food is supposed to be spicy, and as someone who LOVES spicy food, Mission Chinese managed to completely put me off from eating 4 out of 7 dishes ordered. I never knew that things could be spicy in a bad way. 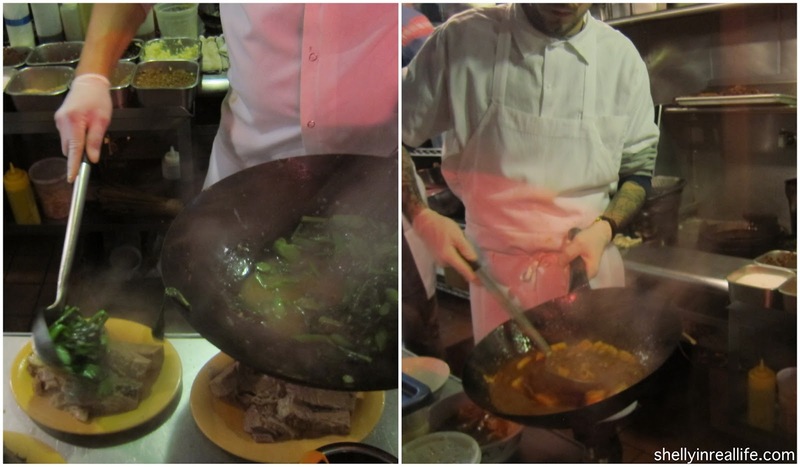 Sorry for the rant, but here goes... first, the timing of our dishes was terrible because we got all 4 dishes at once. I wish we had a 1-2 dishes at the time in the beginning to begin getting acquainted to the flavors, but nope. After a few bites, we got the rest of the dishes. This is already setting us up to fail. For my first bite, I tried the Thrice Cooked Bacon, which I thought would be more bacon, less rice cake. However, that bite alone already started to coat my mouth in numbness. Not the flavorful savory 'nom nom nom' type of spiciness, but the 'do I really want to take another bite?' type of unnecessary spiciness. Then came a bite of the Spicy Buckwheat Noodles, which I thought tasted okay. It pretty much tasted like buckwheat noodles mixed with the flavors of the Thrice Cooked Bacon. As we continued to eat and when our taste buds slowly recovered from the numbness, the buckwheat noodles actually tasted a bit off putting. Let's move on to the famed Mapo Tofu that won the hearts from those at 7x7, basically it stems from the cooking style from the rest of the dishes - numbing spices. It honestly wasn't even that spicy, but with each bite that I took, the more numb my taste buds became, and it became unpleasant. So the only thing that I thought that was pretty good was the Salt Cod Fried Rice, which contained NO spices, and also featured wonderful Chinese sausage. Honestly, you can't go wrong with Chinese sausage. It makes everything taste good. Also, since I could actually taste this dish, it was okay, but not spectacular, and with a price tag of $12, I would just go to another Chinese restaurant in Chinatown for something similar but half the price. So all in all, my excitement for Mission Chinese Food fell completely flat and left my cravings for the wonderful food I had at Han Dynasty in Philly unfulfilled. One of the friends I came here with today had actually been there before. She came back with me today because she wanted for the meal to redeem her past experience, but she too, vows to never come back. I packed the wings, rice and rice cakes to take home. However, we tossed more than half of the green beans and the mapo tofu. Do you understand, I NEVER throw away that much food - I HATE WASTING FOOD. That's how bad it was. For better Chinese food, just walk a few blocks and check out other much better and CHEAPER Chinese restaurants in Chinatown - I've never had casual Chinese food cost me $40 a person. Here are some of my favorites: Congee Village for good Family style food, Great NY Noodletown for wonton noodle soups, great Chinese BBQ, and finally Xi'an Famous Foods, for that taste of spice, similar to Sichuan flavoring, but not so overwhelming that it numbs all of your taste buds. And if you're trying to try something else that's been hyped but actually tastes good, try spending your $40 at Bo Ssam for a wonderful experience. 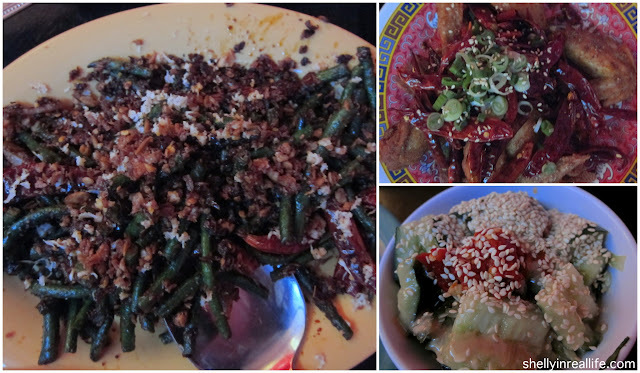 Have you been to Mission Chinese Food in New York or San Francisco? Am I missing something here and just not appreciating? Let me know your thoughts!